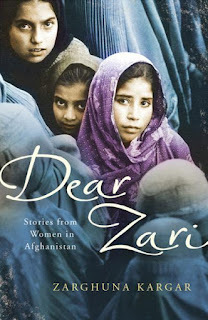 Book Review: Zarghuna Kargar's "Dear Zari: Hidden Stories from Women of Afghanistan"
Home » afghanistan » ebooks » review » translation » Book Review: Zarghuna Kargar's "Dear Zari: Hidden Stories from Women of Afghanistan"
I mentioned in a recent review that sometimes reading acts as escapism for me, but more frequently, reading is about independent learning. Since completing my studies, this has become even more important, as I am unashamedly a learner. Having watched Rory Stewart's documentary on the complex history of Afghanistan, and with my novel in mind, I have been on a quest to learn more about this particular culture. This is what led me to choose to download the ebook version of Dear Zari: Hidden Stories from Women of Afghanistan, and I am so glad I did. Zarghuna Kargar, an Afghan woman now living in London, and a producer and presenter on the successful radio programme Afghan Women's Hour, presents some of the most poignant stories from her time producing the show. Kargar introduces the collection with her own story, chronicling her family's escape from Afghanistan, and her suffering in an unhappy arranged marriage. The rest of the stories are made up of verbatim recordings from the radio programme, as well as accounts of Kargar's meetings with some of these extraordinary women. It is hard to condense this book into a summary, as each story draws you in, and each woman's storytelling is compelling and highly personal. Whether it's the woman who lost a leg in an rocket attack, subsequently losing her husband and daughter because she was viewed as a ruined woman, or the woman who didn't bleed on her wedding night, and had to suffer her in-laws cruelty and disdain for the rest of her life because she hadn't been able to prove her virginity, this collection is a telling insight into the varied culture of Afghanistan. While it is a difficult read due to the cruelty many of these women suffered as a result of being treated like property, it is also extraordinarily inspirational. The woman who loses her husband, and decides to set up a kite making business so her children can still go to school, sent shivers down my spine. The woman who chose her own husband, despite the shame it is considered to bring upon a woman to do so, made me smile. And even the most unhappy stories are inspirational in their own way; these women had the courage to speak out, to share their stories. The fact of inequality in Afghan society has never been so clearly presented to me, and I feel I have a better understanding of the culture as a result. Interestingly, Kargar repeatedly makes reference to many of these oppressive traditions being cultural traditions, not religious traditions; a fact that many people could do with taking note of. Reading this book made me appreciate how tolerant our society is.